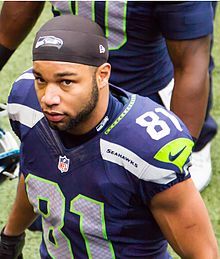 Golden Herman Tate III (born August 2, 1988) is an American football wide receiver for the New York Giants of the National Football League (NFL). He played college football at Notre Dame, where he was recognized as an All-American, and was drafted by the Seattle Seahawks in the second round of the 2010 NFL Draft. He has also played for the Philadelphia Eagles and Detroit Lions, with whom he made a Pro Bowl appearance. Tate was born in Hendersonville, Tennessee. He attended Pope John Paul II High School, where he played football, baseball, and ran track. He rushed 140 times for 1,413 yards and 23 touchdowns as a senior in 2006 to go along with 28 receptions for 510 yards and six touchdowns. He also had three interceptions on defense, returned a kickoff for a touchdown and was the Knights' punter. He was named as a Tennessee Division II first-team all-state pick in 2006 as an athlete by the Tennessee Sports Writers Association and also by the Tennessee Football Coaches Association. His jersey was later retired by Pope John Paul II High School. After he injured his thumb in his senior season and could not play baseball, Tate switched to track and field and posted the state's top qualifying times in the 100-meter dash (10.93 s) and 200-meter dash (22.33 s). He was also a member of the John Paul 4 × 100 m relay squad that captured the state title with a time of 42.86 seconds. Tate was drafted out of high school by the Arizona Diamondbacks in the 42nd round of the 2007 amateur draft. Tate did not sign with the Diamondbacks and instead played baseball for the University of Notre Dame. In 2008, Tate's freshman year at Notre Dame, he played in 18 games and batted .262 with three doubles and three stolen bases. Tate hit his first home run against Louisville in Louisville, Kentucky in his sophomore year. He finished his sophomore season with a .329 batting average after playing in 55 games. Tate also scored 45 runs his sophomore year which is the third highest by any Notre Dame baseball player. On June 9, 2010, Tate was drafted by the San Francisco Giants in the 50th round (1,518th overall) of the 2010 MLB Draft, but did not sign. In the 2008 season as a sophomore, Tate started in 12 regular season games with 52 catches for 903 yards and seven touchdowns for a 17.4 yard per catch average. Tate registered 100-yard games against Michigan, Syracuse, North Carolina, and Pittsburgh during the 2008 regular season, while being tapped First Team All-Independent by Rivals.com. Against the Hawaii Warriors in the Hawaii Bowl, he made six catches for 177 yards and three touchdowns in the 49–21 victory for the Fighting Irish, bringing his season total to 58 catches for 1,080 yards (18.6 yard average) with 10 touchdowns. In 2009, Tate had nine games with at least 100 receiving yards. On October 3, against Washington, he had nine receptions for 244 yards. On November 28, against Stanford in his final collegiate game, he had 10 receptions for 201 yards and three touchdowns. Following the 2009 season, Tate won the Biletnikoff Award. He was also recognized as a unanimous first-team All-American. Overall, he finished the season with 93 receptions for 1,496 receiving yards and 15 touchdowns. On June 5, Tate was involved in an incident in which he and another man broke into a local donut shop at 3:00 a.m.
On September 19, Tate made his NFL debut and had a 52-yard reception against the Denver Broncos. During his rookie season in 2010, Tate caught 21 passes for 227 receiving yards. In addition, he returned 16 punts and a kickoff for 212 total combined return yards. In 2011, Tate recorded 35 catches for 382 receiving yards and three touchdowns. During the replacement referee controversy at the beginning of the 2012 NFL season, the Seahawks won a controversial game against Green Bay in Week 3, in which Tate simultaneously caught a pass in the endzone with Packers' safety M. D. Jennings. According to NFL rules, simultaneous possession goes to the offense. In Week 10 against the New York Jets, Tate recorded his first passing touchdown to Sidney Rice on a receiver reverse pass. In 15 games, Tate made 45 receptions for 688 receiving yards and seven touchdowns. He also made 51 punt returns along with three kickoff returns for 642 total combined return yards. Tate had a breakout season with the Seahawks in 2013. In addition to improving all of his receiving statistics, Tate expanded his role by taking punt-receiving duties. He made some spectacular plays, notably a one-handed catch against the Atlanta Falcons as well as a crucial 71-yard punt return against the Tampa Bay Buccaneers, that highlighted his athleticism and special abilities. In the game against the Buccaneers, he earned NFC Special Teams Player of the Week. Pete Carroll, the Seahawks head coach, said that he would not coach anyone else to do what Tate can do. During Week 7 against the St. Louis Rams, Tate was flagged for taunting following an 80-yard touchdown reception. Carroll chastised Tate after the penalty. On November 2, 2013, Tate was fined $7,875 for his taunting penalty. In the final game of the regular season, Tate produced one of his best games of the year, recording eight catches for 129 yards and a touchdown in another game against the St. Louis Rams. Again, Russell Wilson threw a deep pass of 47 yards to Tate who caught the ball, and ran it for a touchdown similar to Week 7, minus the taunt, as the Seahawks won by a score of 27-9. Tate went on to win Super Bowl XLVIII over the Denver Broncos as a member of the Seahawks. In the 43–8 victory, Tate had three receptions for 17 yards. On March 12, 2014, Tate signed a five-year, $31 million contract with the Detroit Lions. The deal included $13.25 million guaranteed. With new quarterback Matthew Stafford, he set a career-high in receptions with 99, sixth highest in the NFL, and receiving yards with 1,331, seventh highest in the NFL. On January 19, 2015, Tate was selected to the 2015 Pro Bowl, his first Pro Bowl appearance. He was ranked 85th by his fellow players on the NFL Top 100 Players of 2015. Tate and the Lions struggled in the first half of the season but gained momentum in the second half. Tate scored two touchdowns each in Weeks 14 and 15, against the St. Louis Rams and New Orleans Saints, to bring his season touchdown total to six. Overall, he finished the 2015 season with 90 receptions for 813 yards and six touchdowns. In a Week 9 game against the Minnesota Vikings, the Detroit Lions stormed back with 23 seconds left in regulation to tie the game at 16–16. On the first drive of overtime, Detroit marched down the field into field goal range. On 3rd down and long, Stafford threw a pass to Tate. He "flipped in" for the touchdown to give the Lions a 22–16 comeback win in overtime. Tate finished the 2016 season with 91 receptions for 1,077 yards and four touchdowns. He eclipsed the 1,000-yard mark for the second time in his career and the 90-reception mark for the third time in his career. Tate's 676 yards after the catch ranked highest among NFL wide receivers that season. On September 10, 2017, Tate made his season debut against the Arizona Cardinals. In the 35–23 victory, he recorded his 12th career game with at least 100 receiving yards. He finished the day with ten receptions for 107 yards. Overall, he finished the 2017 season with 92 receptions for 1,003 yards and five touchdowns. On October 30, 2018, Tate was traded to the Philadelphia Eagles in exchange for a third-round selection in the 2019 NFL Draft. Overall, he had 74 receptions for 795 yards and four touchdowns. On January 6, 2019 in the Wild Card Round against the Chicago Bears, Tate made the clutch game-winning touchdown catch on fourth down on a ball thrown by quarterback Nick Foles. The catch helped the Eagles advance onto the divisional round against the New Orleans Saints. In the 20-14 loss, he had two receptions for 18 yards. On March 14, 2019, Tate signed a four-year, $37.5 million contract with the New York Giants that includes $23 million fully guaranteed. He is the son of Golden Tate Jr., a former wide receiver at Tennessee State who was the 120th overall pick in the fifth round of the 1984 NFL Draft by the Indianapolis Colts. His younger brother, Wesley Tate, was a running back for Vanderbilt University. His younger twin sisters Breanna and Deanna Tate are both sprinters at The University of Mississippi. In March 2017, Tate married Elise Pollard. ^ Simmons, Andy. "Lions' wideout, former JPII standout, Golden Tate brings annual skills camp back to school". The Tennessean. Retrieved March 28, 2018. ^ Brooks, Chris. "Golden Tate has jersey retired by alma mater". The Tennessean. Retrieved April 27, 2018. ^ Bennett, Brian (August 19, 2009). "Bennett: Tate headlines Notre Dame's receiving corps". ESPN.com. ^ a b "Golden Tate". thebaseballcube.com. ^ "NFL Draft - College Baseball 360". collegebaseball360.com. ^ "50th Round of the 2010 MLB June Amateur Draft - Baseball-Reference.com". Baseball-Reference.com. ^ "Golden Tate Baseball Statistics [2008-2009]". www.thebaseballcube.com. ^ "Golden Tate College Stats". College Football at Sports-Reference.com. Retrieved March 28, 2018. ^ "Golden Tate 2007 Game Log". College Football at Sports-Reference.com. Retrieved March 28, 2018. ^ "Golden Tate 2008 Game Log". College Football at Sports-Reference.com. Retrieved March 28, 2018. ^ "Michigan at Notre Dame Box Score, September 13, 2008". College Football at Sports-Reference.com. Retrieved March 28, 2018. ^ "Syracuse at Notre Dame Box Score, November 22, 2008". College Football at Sports-Reference.com. Retrieved March 28, 2018. ^ "Notre Dame at North Carolina Box Score, October 11, 2008". College Football at Sports-Reference.com. Retrieved March 28, 2018. ^ "Pitt at Notre Dame Box Score, November 1, 2008". College Football at Sports-Reference.com. Retrieved March 28, 2018. ^ "Hawaii Bowl - Notre Dame at Hawaii Box Score, December 24, 2008". College Football at Sports-Reference.com. Retrieved March 28, 2018. ^ "Washington at Notre Dame Box Score, October 3, 2009". College Football at Sports-Reference.com. Retrieved March 28, 2018. ^ "Notre Dame at Stanford Box Score, November 28, 2009". College Football at Sports-Reference.com. Retrieved March 28, 2018. ^ "Consensus All-America Teams (2000-2009)". College Football at Sports-Reference.com. Retrieved March 28, 2018. ^ "Golden Tate 2009 Game Log". College Football at Sports-Reference.com. Retrieved March 28, 2018. ^ Rosenthal, Gregg. "Tate leaving the Golden Dome, too". profootballtalk.nbcsports.com. December 7, 2009. ^ "NFL Events: Combine Player Profiles - Golden Tate". www.nfl.com. ^ "2010 NFL Draft Listing". Pro-Football-Reference.com. Retrieved March 28, 2018. ^ O'Neil, Danny (June 8, 2010). "The great maple bar caper: Seahawks' Golden Tate caught in 3 a.m. visit to Top Pot Doughnuts". The Seattle Times. Retrieved March 6, 2019. ^ "Seattle Seahawks at Denver Broncos - September 19th, 2010". Pro-Football-Reference.com. Retrieved March 28, 2018. ^ "Golden Tate 2010 Game Log". Pro-Football-Reference.com. Retrieved March 28, 2018. ^ "Golden Tate 2011 Game Log". Pro-Football-Reference.com. Retrieved March 28, 2018. ^ "Watch Seattle Seahawks vs. Kansas City Chiefs [08/24/2012] - NFL.com". www.nfl.com. ^ Craggs, Tommy (September 5, 2012). "NFL 2012" – via Slate. ^ "NFL Football Highlights, Clips & Analysis - NFL.com". www.nfl.com. ^ "Golden Tate 2012 Game Log". Pro-Football-Reference.com. Retrieved March 28, 2018. ^ "Tampa Bay Buccaneers at Seattle Seahawks - November 3rd, 2013". Pro-Football-Reference.com. Retrieved March 28, 2018. ^ "2013 NFL Week 9 Leaders & Scores". Pro-Football-Reference.com. Retrieved March 28, 2018. ^ "Carroll trusts Golden Tate to take chances". ESPN.com. ^ "St. Louis Rams at Seattle Seahawks - December 29th, 2013". Pro-Football-Reference.com. Retrieved March 28, 2018. ^ "Super Bowl XLVIII - Seattle Seahawks vs. Denver Broncos - February 2nd, 2014". Pro-Football-Reference.com. Retrieved October 9, 2017. ^ "Golden Tate, Detroit Lions strike five-year contract". NFL.com. ^ "Golden Tate 2014 Game Log". Pro-Football-Reference.com. Retrieved March 28, 2018. ^ "2014 NFL Receiving". Pro-Football-Reference.com. Retrieved March 28, 2018. ^ "2014 NFL Pro Bowlers". Pro-Football-Reference.com. Retrieved March 28, 2018. ^ "'Top 100 Players of 2015': No. 85 Golden Tate". NFL.com. Retrieved March 28, 2018. ^ "Golden Tate - Detroit Lions - National Football League - Yahoo! Sports". Yahoo Sports. ^ "Golden Tate 2015 Game Log". Pro-Football-Reference.com. Retrieved March 28, 2018. ^ "Detroit Lions at Minnesota Vikings - November 6th, 2016". Pro-Football-Reference.com. Retrieved March 28, 2018. ^ "Golden Tate 2016 Game Log". Pro-Football-Reference.com. Retrieved March 28, 2018. ^ "Golden Tate Advanced Stats and Metrics Profile: Yards After Catch". PlayerProfiler.com. ^ "Arizona Cardinals at Detroit Lions - September 10th, 2017". Pro-Football-Reference.com. Retrieved October 6, 2017. ^ "Golden Tate 2017 Game Log". Pro-Football-Reference.com. Retrieved March 28, 2018. ^ "Lions' Golden Tate: Catches touchdown in season opener". CBSSports.com. Retrieved October 11, 2018. ^ "Lions' Golden Tate: Again sees double-digit targets". CBSSports.com. Retrieved October 11, 2018. ^ "Golden performance not enough for Lions in loss at Cowboys". AP NEWS. September 30, 2018. Retrieved October 11, 2018. ^ Bergman, Jeremy (October 30, 2018). "Lions trade wide receiver Golden Tate to Eagles". NFL.com. ^ "Golden Tate 2018 Game Log". Pro-Football-Reference.com. Retrieved March 6, 2019. ^ "Wild Card - Philadelphia Eagles at Chicago Bears - January 6th, 2019". Pro-Football-Reference.com. Retrieved March 6, 2019. ^ "Divisional Round - Philadelphia Eagles at New Orleans Saints - January 13th, 2019". Pro-Football-Reference.com. Retrieved March 6, 2019. ^ Bergman, Jeremy (March 14, 2019). "Giants agree to terms with receiver Golden Tate". NFL.com. ^ "1984 NFL Draft Listing". Pro-Football-Reference.com. Retrieved April 27, 2018. ^ "Vanderbilt Official Athletic Site - Vanderbilt University". ^ "Ole Miss Official Athletic Site - The University of Mississippi". ^ "Lions' Golden Tate gets married, shows off wedding photo". CBS Sports. March 17, 2017. Retrieved August 24, 2017. 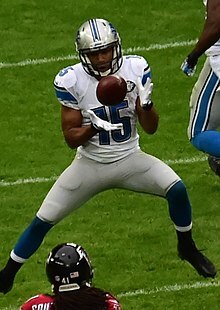 Wikimedia Commons has media related to Golden Tate.